There have been some exciting technological breakthroughs in ergonomics over the past decade, particularly for practitioners. When I began my career as an ergonomist back in “the good old days,” we conducted musculoskeletal disorder risk assessments using pen and paper (observation-based). Those days are over, thanks to technology. Here are a few major technological advancements we’ve seen over the past ten years. When I started working at Humantech in 2007, our Risk Priority Management (RPM) software application served as an online database for our clients’ MSD risk assessments. Data was stored digitally and was accessible anywhere in the world. Then, in 2013, The Humantech System® was launched. This robust system enables users to learn online and share assessments and improvement plans across the world. It is available in multiple languages and houses everything your company needs to effectively manage ergonomics on a global scale. Smartphones and tablets changed the entire world, including the field of ergonomics. Virtually everything I need to do my job now fits in my pocket. Gone are the days of filling in data collection sheets and taking them back to my desk to manually enter the data on my computer. Now, I can log into The Humantech System and complete an assessment in a matter of minutes. Breakthrough #3 – Smarter Assessments with A.I. 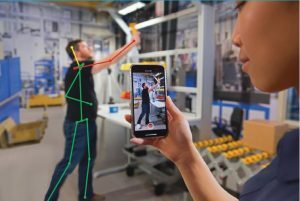 Artificial intelligence and computer vision have made it possible to get an accurate MSD risk assessment using the camera on any mobile device. With this sensorless technology, we start by recording a video of an employee performing a task. From the video, the application calculates joint angles, frequencies, and durations of the employee’s postures during movement. We’re left with a complete quantitative whole-body assessment—and a whole lot of extra time to do other things, like implement improvement plans. Look how far we’ve come in ten years. I can’t wait to see what comes next!